OK so Victoria got best photo this week and starts talking about her mom again... and I know I keep saying it but these girls really do look like hybrids of girls past. Victoria doesn't pick ANYONE to share the Tyra suite with- hmm... that's not very nice! But more drama ensures as Kristin delves into Destiny's back for a lighter [?] without asking which prompts the two girls to have a fight. Kristin tries to lure Destiny into hitting her so she would go home LOL!!! Destiny doesn't take the bait and Nastasia calls her out for it... but meh... lame fight. The girls' challenge this week is an acting challenge with Tyler Perry, where they have to embody a particular character- tourist, Hollywood diva, rap artist and street performer. So Victoria did an amazing job until she got fish and chips thrown at her! In the end, Kiara wins the challenge- getting 10,000 dollars for a scholarship (if she wins) and a walk on roll for a Tyler Perry production. For their photoshoot this week, the girls are on the set of 'War of the Worlds' for their zombie apocalype shoot, which is actually quite high fashion. Victoria is safe as is Nastasia who is too posey. Kristin is NOT changing things up and just sat there looking pretty, laughing at times. Laura does a good job as does Leila. Destiny suffers- go home now? You can tell who's working it even in a group shot that isn't aired- Laura and Leila are fierce. At panel, Kiara's scores are slipping with a average photo, Brittany gets another great shot and a high score (8,8,9)- I loved her photo it had great character! Victoria's shot was definitely too angelic and pretty- not aggressive enough. Destiny has another poor shot and is a likely contender to go home. Laura has yet another stunning shot and gets 9s all round. Tyra critiques her for having no neck. Nastasia is literally just standing there but there is some micro-movement with her head. Not as strong as her other shots I don't think. Yvonne gets a bad shot and a bad score but her challenge score might save her... Bye Bye Destiny I think! And Laura/Brittany for best photo please? LAURA YESSSS followed by Leila and Brittany. In the bottom are Yvonne and Destiny. A rightful bottom two. Who goes home? Yvonne stays with 2.5 points more than Destiny! Bye bye Destiny! Next week, the girls do a cheerleading photoshoot and a charity fashion show and more drama, this time with Laura and Leila is to be expected. SHOTS OF ELIMINATED GIRLS- I thought Jessie did OK- better than Destiny, but still not as strong as it needs to be to get her back into the competition. Darian's is just... smh... not even a zombie. 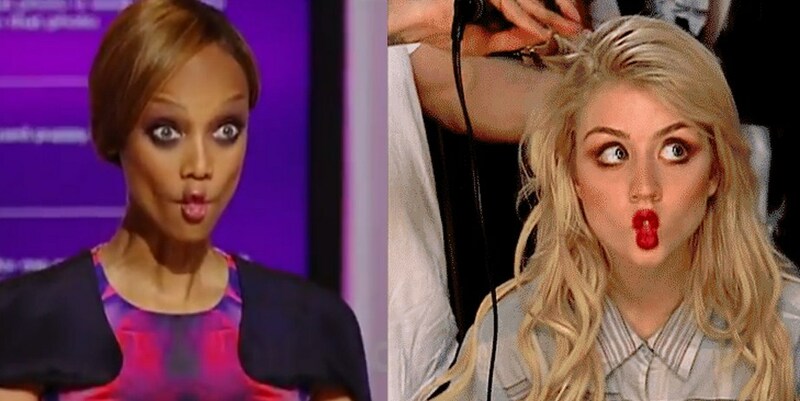 I’m confused on the Tyra/Rob promo, are they airline pilot zombies? If they are both zombies why would Rob still try to eat Tyra’s face off? I guess this is fashion, and doesn’t have to answer any questions. I missed the last episode of “America’s Next Top Model,” because of my new work schedule at Dish. I’m starting to come around on the new judging system. My Hopper has this episode recorded, along with my other favorite shows since I have so much space available. 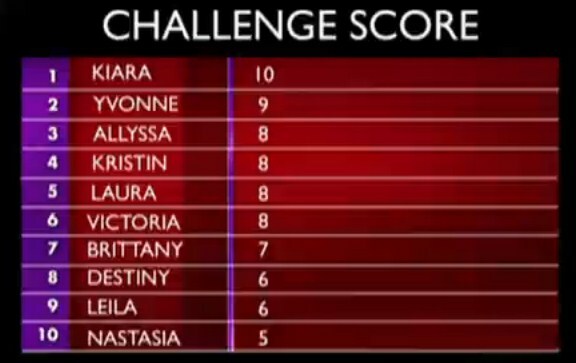 Destiny’s elimination was not a surprise, but I’m surprised about Kiara’s score.